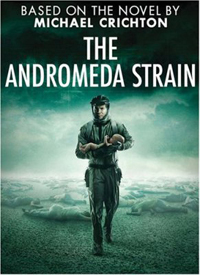 I got a sneak peak tonight at the upcoming re-make of Robert Wise's film adaptation of "The Andromeda Strain" by Michael Crichton. This new adaptation is brought to us in mini-series form as has become popular with producers lately (see nu BSG, V, Band of Brothers, Spartacus, Dexter, Jekyll, Second Coming, Taken et al) and is well worth a look when it gets a full release in the UK… whenever that ends up being. It's already aired in Australia and will be on US TV later this month. For those who care about such things, beware of spoilers ahead. Lots of them. I mean, I'm going to completely ruin this for you if you don't want to know what happens. The roughly three-hour long miniseries tells the tale of a satellite that falls out of the sky in Utah, unleashing a deadly virus on a small town and wiping out all its inhabitants. As you would expect, it doesn't stay contained there for very long and before long its spread becomes a serious issue involving secret science labs, the US President, lots of soldiers and words like "national security". There's also a fairly obscure sub-plot revolving around the NSA leaking information to the media and blackmailing a scientist to keep a sample of the virus (which, by the way, can kill a person in ten seconds or less) for potential later use against Korea or Russia. It starts off gloriously with some scenes that remind of 28 Days Later, not only visually but also in the music (and there's even a direct verbal reference to that film of all films later on). There's the token beautiful scientist, the clichéd reporter-on-the-run, the standard hi-tech lab with dubious computing power built-in as standard and a gorgeous fighter jet to boot. Naturally, the fighter quickly crashes and blows up in an impressive display of pyrotechnics half-way through the story. 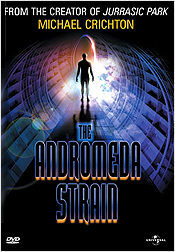 But, despite all these seemingly bog-standard "disaster film" ingredients, The Andromeda Strain manages to not be clichéd at all… at least, I didn't find it that to start with. The characterisations are remarkably deep, the technology is surprisingly plausible in this day and age given the crap that keeps popping up on Gizmodo all the time, and that beautiful scientist really is gorgeous. Alas I did find that things started to get a little out of hand towards the end. I didn't have a problem with huge flocks of eagles pecking an entire squadron of trained US soldiers to death (those gas marks must have made aiming fairly difficult, after all) but as soon as the virus (which, by the way, was actually sent through a wormhole from future-Earth) started visually spreading across the Nevada desert like a tidal wave, my eyes might have rolled a couple of times I have to admit. Add to that some oddities. An alcoholic man (hurray, it's Tom McBeath!) picked up in the town almost seemed to be causing the spread of the infection when the original outbreak was revisited through flashbacks, but this was never even alluded to afterwards. A fair amount of time is spent diagnosing this man and his seemingly random immunity to the "Andromeda" bacteria (yea, it wasn't actually a virus after all), along with a baby in a similar condition, but aside from a throw-away line when the cause of this immunity is discovered, this is never used or revisited at all. He simply appears to vanish once the obligatory self-destruct panic begins and the science team starts dying one by one… and the unexplained psycho dream which solved that mystery is never even mentioned. My biggest gripe was the over-abundance of technobabble. Don't get me wrong; I love technobabble. And coming from a scientific background I think I even managed to follow it pretty well. Frankly, despite (or maybe due to) the fantastic nature of the story a lot of the science seems to make sense, at least to the audience who will of course gloss over tiny factual inconsistencies. And in general the story manages to mix in the military/political scenes really well, which can be hard to find in productions these days. But that technobabble frequently just appears out of nowhere and becomes the sole occupant of the screen for up to ten minutes at a time. These are the only places where I felt the narrative drifted into a completely different realm, painting a second, chattier side to the style of the story. And, naturally, once you find out that the satellite contained not only a horribly lethal disease but also the instructions to beat it encoded in ASCII within the molecular structure of its casing (complete with a tidy rotating 3D logo), you might expect an ending a little more science-fiction-esque than a calm funeral and the quiet execution of two corrupt soldiers in a car park. Granted, that dolly-out shot of the International Space Station was neat and having "Andromeda" left in the prophesised storage container very nicely leaves the story open for further havoc. But … we know it won't. This is a one-shot deal, and after the film gently turned from an enthralling and disturbing scientific mystery into a standard "oh my god we need to get to the self destruct cancel button but we can't get there without plummeting to our deaths one by one" disaster movie, such a subtle ending brought all the story's inconsistencies and foibles right to the surface. I mean, really, where did all that falling junk in the science lab maintenance shaft come from? You have the computer from Star Trek (and a gym, perfectly handy for when the world's in unimaginable danger), but when the epilepsy lights go off all the ceiling panels have to fall down and knock crucial characters to their deaths? OK.
Don't forget the overarching environmental message, too. What started off as yet another sub-plot (seemingly more random than the other one) about a fanatical environmental group campaigning against ocean mining turned into a very relevant sub-plot, but was subsequently all but tossed aside. Its only serving point appeared to be as a platform upon which the main character could stand on as he waxed lyrical about how man is destroying the planet. A nice message to be sure, and it is nice to hear that in contemporary film once in a while, but because this story was adapted from a 1971 film that itself came from a 1969 novel (you know, before environmental issues were anywhere near mainstream), it just doesn't seem to fit. Seriously, though, it's well worth a watch because despite my whining these flaws are surprisingly easily overlooked. I wouldn't attempt to claim even for a second that this miniseries didn't captivate me for the full two hours and forty minutes. I can only hope that the IMDb user who, five years ago, said "hopefully no one will re-make it" regarding Wise's 1971 film won't be too disappointed. And that scientist really, really was gorgeous.